Mt. Everest climber was able to raise the picture of Buddha, Dalai Lama and Obama at the summit. Not just foreign climbers, but Nepalese citizens themselves have been able to set high records. One of them is Ang Gyaljeng Sherpa. 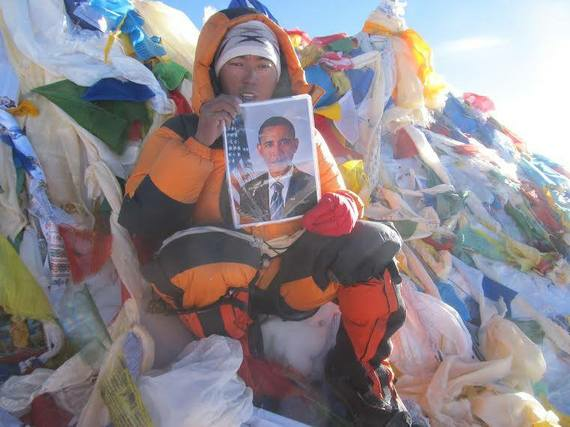 World record holder Sherpa who was able to raise the flags with messages of Gautam Buddha, President Barack Obama and the religious leader Dalai Lama on May 29 2013 has come to America. He shall "Root Set" at the "Everest Day Wall Climbing" competition being held on the occasion of the International Sagarmatha Day at USA Nepal Climber's Association in New York. International Sagarmatha Day is held on May 29 on the occasion of the first men to have climbed the world's tallest peak Mt. Everest. 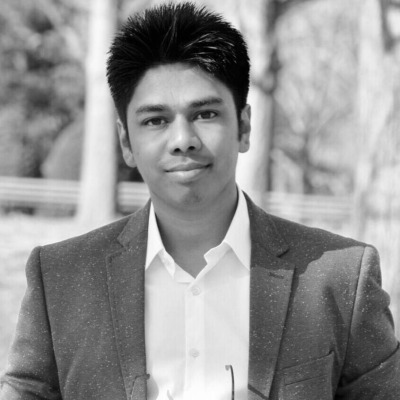 Sherpa shall act as a judge at the event being held at New York's Long Island, which is a part of world's most powerful nation America. Sherpa who is also famous in Europe has scaled Everest for over 3 times. 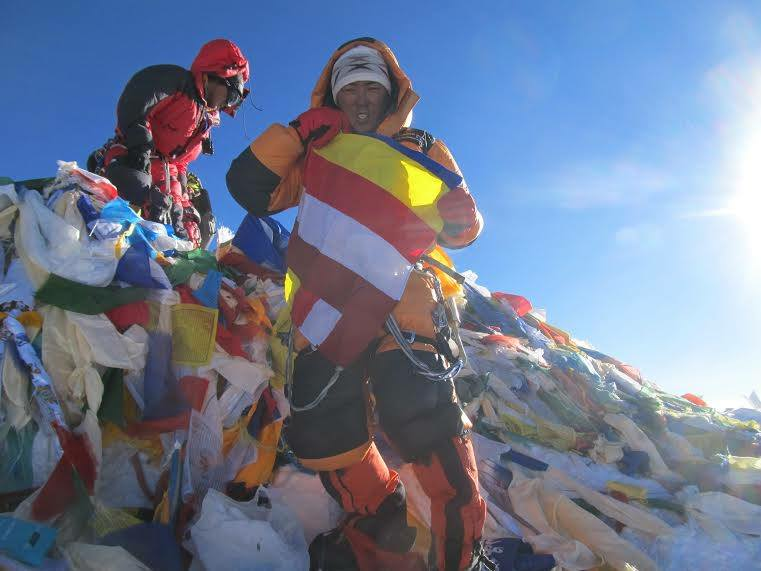 Sherpa has scaled the Everest in 2011 on the occasion of Nepal Tourism Year, in 2012 on the occasion of the Lumbini Visit Year and in 2013 for the third time. Besides, Sherpa has also scaled many other mountains taller than 8000 meters. In 2010 he scaled Manaslu is known as Killer Mountain (8163 m.) and Mt. Lhotse in 2012( 8516 m.) successfully. Sherpa has a deep relationship with the mountains. Sherpa born in Solukhumbu has already scaled Iceland Peak (6160 m.) for 24 times, Mera Peak (6654 m. ) for 24 times, Yala Peak 4 times, Lubuche Peak 5 times, Pisang Peak 6 times and Chulu Himal 12 times. Sherpa has also scaled Ama Dablam located at 7000 m. Above sea level. The Multi-Dimensional individual Sherpa who has fantastic knowledge of French, Japanese, Hindi, English, Tibetan along with education of Bachelor degree said that he had plans to climb Mt. Denali in the near future. Nepal faced massive earthquake during the time Ang Gyaljeng helped to rescue in Langtang and Mt. Everest Area. Sherpa who scaled Mt. Blanc of France in 2010 said, " I am planning to climb America's tallest peak Denali on this occasion. Because of this reason, I shall remain in America for a while." 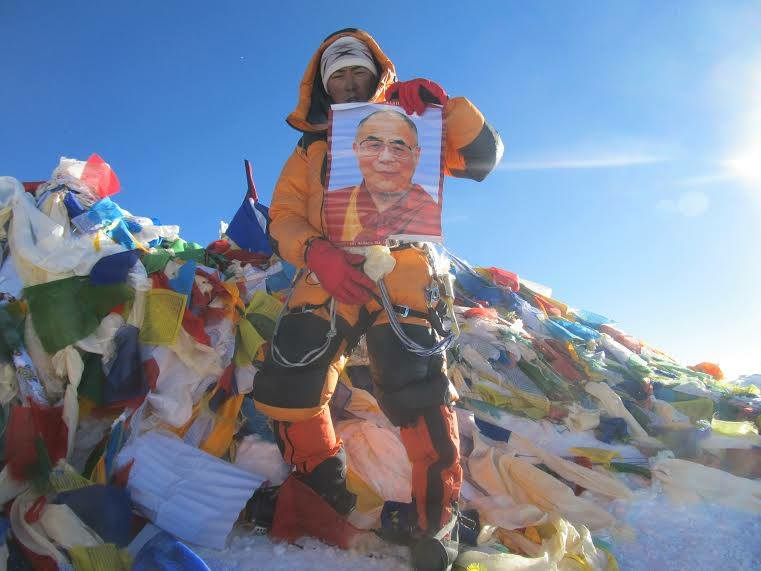 Expressing his happiness at the successful scaling of Everest this year, he reminded people of his service to the people during the snowstorm at Everest summit. Sherpa who participated as the member of the rescue team for over 3 times was awarded with " NMGAAdventure Award" in 2011 Besides, in 2013, International Mountain Guide, Sherpa received "Guide of the Year" award. On the other hand, Sherpa has received many awards, recognitions and other honors. Sherpa is also a member of Nepal Mountaineering Association, Nepal National Mountain Guide Association, Sagarmatha Climbers Association, USA Nepal Climbers Association and a member of the Lions Club. He has taken Nepal's pride to the international arena.